So, Monoprice isn't offering tablets anymore, much less pen replacements (I have a Monoprice tablet and my pen went missing, they aren't stocking replacements), and as such I'm confined to using my Adesso instead. Black Ink will recognize my tablet and movement from it, like a mouse, but it's SUPER sensitive, almost tripling my mouse movespeed for the entire laptop - something that PhotoShop CS2, FireAlpaca, Krita, do not do. However, the most important issue is that it won't recognize the "click", rendering everything useless. 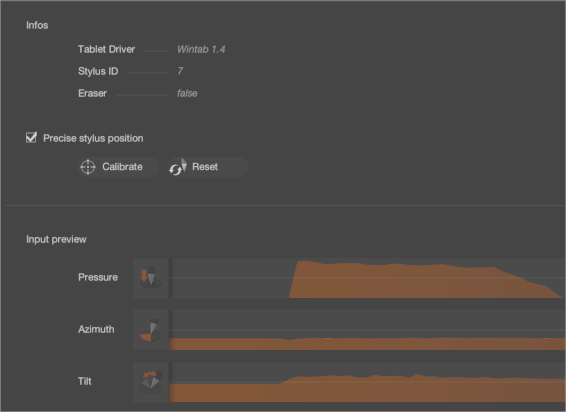 Second do you have made a tablet calibration ? If it still doesn't work try to uncheck the "Precise stylus position". For the click problem it's the first time I get such report. Tell me if you still have such problem. No worries on never hearing about it before - there are so many tablet makers out there it's hard to keep track of it all. I do have the latest driver. However, the last time they updated it was back in '12. I tried out the input previous and after some messing around I finally managed to get the tilt to pick up, but that was it. Attempting to calibrate the program to the tablet, it wouldn't register anything but mouse clicks, and even then it was having issues probably because of the 4k monitor on my laptop. If the compatibility just isn't there right now, I get it! I'm also willing to help provide you any information you need to help get it rolling in the future, too. Well I'm an idiot. There's nothing actually wrong with my tablet - my pen nib wasn't pressed in all the way apparently and that was causing a lot of my issues. The only thing I'm running into at the moment is that my pressure sensitivity is pretty low - is there any way to bump that up? I'm also wondering - wasn't there a "4K" resolution option? I swear the GUI was bigger, but it seems like everything's wayyy smaller in the latest update? For the pressure we don't have a general rule to shift or scale the input.. Generally the Tablet driver should give you such feature. Unfortunately the only way is to tweak brush by brush the input pressure by using a multiply operator. Tell me if you need more info.